Lindsay Barron was an unemployed teacher who was first challenged by the stress of substitute teaching and then by temp firms where she was told, “You have no skills.” Lindsay decided to shape her own career destiny by launching The Whole Child Learning Company, which provides enrichment services for young children (age 2-5) in child care centers, preschools and other venues. Read my interview below about Lindsay’s journey to successful education entrepreneurship. Lindsay, what type of career did you have before you launched your business? I was a Title 1 Preschool Teacher in Roanoke City Public Schools. This was my first job out of college and I taught for 3 years until my husband accepted a new position with his company that required us to relocate. I absolutely loved teaching preschool and hated to leave my job, but we believed that his career needed to take precedence as his earning potential in his field was greater and we thought that I could teach anywhere. I resigned my position when we moved to Pennsylvania (in 1996). I had several months to prepare and I applied for certification in Pennsylvania and sent in for all the required clearances, fully expecting to have all my paperwork in order in time for the summer hiring season in Pennsylvania. Unfortunately, the required FBI clearance did not come back until late September so my application was considered incomplete and I was ineligible to be hired. Even if I had a complete application, I doubt that I would have gotten a job because the area where I lived (Chester County Pennsylvania) and some of the surrounding counties had a very competitive hiring environment. These districts paid very well and teachers did not leave their jobs willingly — there was a recession going on at that time, although not as serious as our current recession. I began substitute teaching, which I found very stressful. I was still hopeful of landing a position for the next academic year and substitute teaching can be a great way to get to know principals and develop a good reputation. I was always anxious to do a good job and make a good impression; however, you never knew what you would face each day when you walked into a strange classroom and if you would have a good day or a horrible day. Little things are not in your control. For example, a teacher might leave needed materials under a pile of papers, making them impossible to find, and then you look incompetent. I became discouraged with the substitute teaching route and decided to try temp work. This was even more discouraging because when I took the typing test and other evaluations I was informed, “You have no skills.” At this point I began thinking about doing something on my own working with young children. Please tell us more about The Whole Child Learning Company. We have four programs: GiggleBytes computer classes, Little Amigos Spanish classes, BusyBodies movement fitness and health, and Great Minds. The first three programs are full service specialty instruction that child care centers do not have the expertise, staff , or budget to offer themselves. The classes provide a convenience for busy working parents who don’t want to add another activity in the evenings or on weekends. Great Minds, our newest program, is an in home customized tutoring service for children age 4 to college aged. We have expanded through franchising and have 35 franchises in various states. We were fortunate that our business model is very low overhead. As a home based business, we do not require a retail location, or even commercial office space. Our classes are offered on site in existing locations of child care centers, preschools and private schools. Start up costs were relatively low as it was mostly just the cost of a computer and software, and the model also allowed us to begin generating revenue as soon as classes were started in a location. In the beginning, I would get schools started and teach them myself. Then, as we found additional locations to offer our services I would hire a teacher to replace myself and I would develop a new schedule of 5-7 locations, then hire another teacher, etc. We were aggressive about marketing our program to the venues that could offer our services and we focused on our quality. We were very motivated, especially after my husband, Matt, quit his job and we decided to move to Texas for both of us to pursue our business full time. It was very much a feeling of sink or swim. We were relying totally on ourselves and we had burned our bridges so failure was not an option. It was scary but we were totally focused. We used credit cards to see us through until we were able to replace our former income within a few months. Everyone knows that teachers don’t do the job for the money – the pay is relatively low compared to other professional fields. I definitely make more money as an education entrepreneur than I would as a public school teacher but I’m still able to work with children and be a positive influence in their lives. My professional background as an educator definitely helped me relate to the Directors of the child care centers. I was also able to develop quality curricula and programs and parents really recognize the benefit of this. I love the fact that our business has a positive influence on people’s lives. 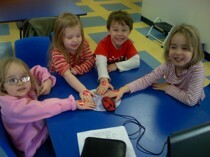 The children who participate in our classes benefit from quality programs and learning important skills and concepts. The teachers whoteach our classes benefit from a position that is a great lifestyle fit for the right person. All of our teaching positions are part time because of the nature of the preschool day — the kids nap for two hours in the middle of every day. We usually hire teachers who have left the public school system, often after they have children themselves and they want to work part time and be paid well for their time but still want to be able to pick the kids up from school or be home when they get off the bus. Our franchisees benefit from the opportunity to become entrepreneurs and build their own businesses. They can develop incomes that exceed the average income for most public school teachers and they can have more freedom and control over their time. The franchisee/franchisor relationship can be challenging. The franchisor has a mentoring role as well as something of an authority figure role. Additionally it is important to serve the needs of your franchisees. Although the franchisor tells the franchisee what to do and how to do it, the franchisee is also, in a sense, a client or customer as they have purchased a business, so it can be a balancing act. I had to learn to do sales. As a teacher I never anticipated or wanted to do any kind of sales. I can remember sitting in my car outside child care centers working up my courage to go in and speak with the director. I’m really a fairly shy person and sales were very uncomfortable for me, but it was necessary and I learned to do it, and even enjoy it. The feeling of completing a successful sales call and establishing new business is fantastic! I also had to learn to delegate and to be an effective supervisor or boss — these are skills that I’m still working on! Do lots of research. Research your market and especially your competitors. Don’t let competition scare you off of a good idea — if someone else is successful running a business then there is usually room for someone else who can do it better or at a lower price. You have to be careful to fully understand your costs so that you don’t put yourself into a situation where you can’t make a profit. When you start a business, your passion, enthusiasm and commitment can give you an edge in providing excellent service which can help develop loyal customers or clients. Expect to work hard in your start up phase. Starting a business is like having a newborn – it is 24/7 and all consuming in the beginning. I would not accept a salaried job now even if I were offered one, and neither would Matt. We are really excited about the future of the company! Last year through the economic downturn we saw a decline in franchise sales, which was not surprising and reflected the overall trend in franchising nationwide among all kinds of franchised businesses. However, our revenue from class tuition did not decrease. While almost nothing is truly a “recession proof” business, parents seem to be willing to reduce costs in other areas in order to provide educational opportunities for their children. We are making some changes to our structure to make our franchise more accessible including selling our four separate programs as stand alone franchises rather than a bundled package. The cost for a single program unit will be lower than our current model and franchisees can have the option of adding an additional program for flexibility in their markets. With many new teachers unable to find jobs and other experienced teachers taking early retirement packages, we believe this will result in lots of new territories being established. It is a great opportunity for those teachers. To read more about Lindsay’s company, please visit WholeChild.com.